Once again Syriac Music is going toward the scene to give its lovely audience another chance to go back to their beautiful and nostalgia times. “Moments of Nostalgia” is the name of Syriac Music’s second folk music’s show which will be performed at the stage of Estrad Theater at Folkets Hus in Södertälje – Sweden in November 27th. One of our goals in Syriac Music is to preserve and publish the Syriac folk song. We mentioned that one of best methods of publishing our folk songs is to perform concerts. In 2003 and 2004 Syriac Music celebrated our great church father St. Ephraim by singing his hymns in a special concert. St. Ephraim’s concert performed in eleven churches and attended by more than 3500 spectators. 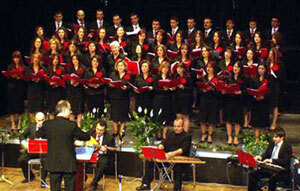 In 2005 Syriac Music presented the first epoch of the Syriac folk songs where the theater was fully booked in two successive nights. Many positive comments came after the last concert. One of them was from a spectator who said: “thank you because with such concerts we retrieved our dignity as audience”. In our new concert we will continue journey with the old Syriac songs. The songs that became nostalgia in the hearts of the generation that lived during the commencement of the Syriac folk song. After Rihimto dleb, Shamo Mar, Talo Dshafro and other songs which we performed in the last concert we will present Btad’o Abirina, Lebi Kkoyew, Talo Sagi and other wonderful songs that have been sang during the sixties and the seventies. A participation of the famous soloists Ninib Lahdo, Sardanapal Asaad, Foud Spir and Aboud Zazi will leave a marvelous touch on the concert exactly as it did in the last concert. Syriac Music´s choir will sing under the leadership of Issa Habil and with the accompaniment of an oriental orchestra. Reduced price for choir members and students (during the first concert only).